78 Landscape Architect and Specifier News I n f o r m a t i o n R e q u e s t # 5 3 8 Rice University Opens New Outdoor Fitness Park Located just north of the Barbara and David Gibbs Recreation and Wellness Center on Rice University's campus in Houston, Texas, is a new outdoor fitness park that was recently unveiled during the school's Week of Wellness. The park contains the usual workout equipment one would find in such a space. Pull-up bars, parallel bars for tricep dips, incline benches, push-up bars and more, are all located within the outdoor training park (OTP). There are also instructions on how to properly use the equipment, found at each station. Due to the sweltering heat common to the area, the OTP was strategically placed in a large grove of trees to allow for tolerable use during hot summer months. Additionally, in line with the topic of location, the new OTP was placed along a crushed granite running trail that loops around the campus, allowing walkers and runners the opportunity to receive some free strength training during their workout. A water fountain is slated to be constructed later this year, according to the Rice news page pertaining to the matter. L.A. County Receives Innovation Awards The Innovation Awards honor park and recreation agencies that demonstrate innovative practices in their communities through health and wellness, park design, conservation and social equity. The Los Angeles County Department of Parks and Recreation received two Innovation Awards by the National Recreation and Parks Association in 2018. Earlier this year, the department won NRPA's Innovation of Health Award for its Parks After Dark program. The program seeks to diminish violence and provide services to families and youth. According to NRPA's website, Parks After Dark works to increase "social cohesion, physical activity, perceptions of safety, collaboration among stakeholders to offer services at parks, access to recreational programming and services and cost savings for the county." 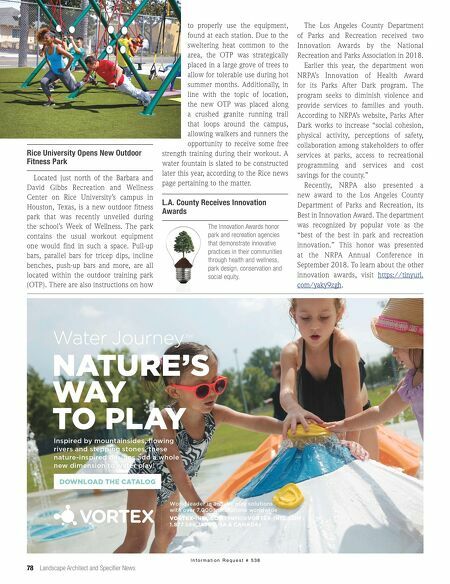 Recently, NRPA also presented a new award to the Los Angeles County Department of Parks and Recreation, its Best in Innovation Award. The department was recognized by popular vote as the "best of the best in park and recreation innovation." 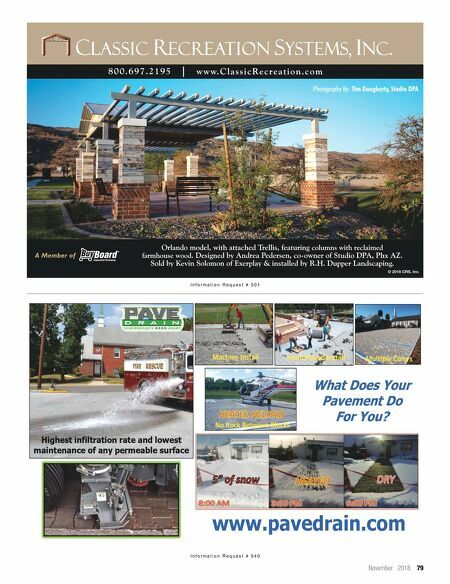 This honor was presented at the NRPA Annual Conference in September 2018. To learn about the other innovation awards, visit https://tinyurl. com/yaky9zgh .